Combine 12 cups water, the brown sugar and cinnamon sticks in a large pot and bring to a boil over medium-high heat, stirring until the sugar dissolves. Stir in the pumpkin and return to a simmer. Meanwhile, remove the zest from the limes in wide strips using a vegetable peeler; add the zest to the pot and simmer 15 minutes. Let cool, then refrigerate until the liquid is cold and the pumpkin pulp settles to the bottom, 2 to 3 hours. Working in batches, ladle the liquid into a fine-mesh strainer set over a pitcher (repeat if necessary to strain out all the pumpkin pulp). Discard the pulp and lime zest. 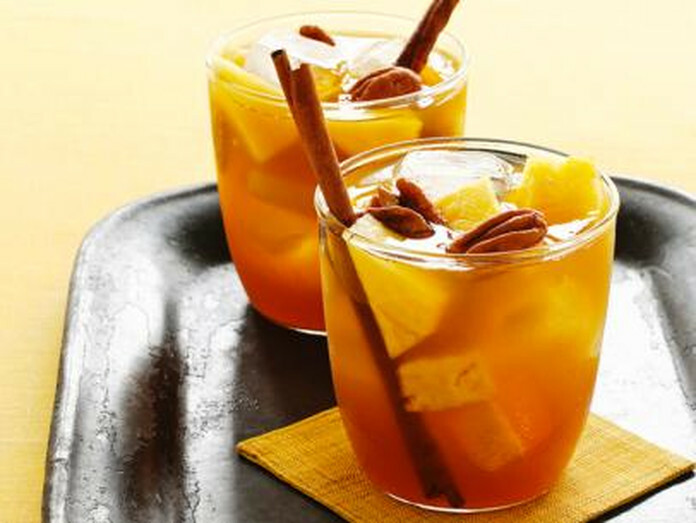 Return the cinnamon sticks to the punch and refrigerate until ready to serve. Pour the punch into ice-filled glasses. Add rum, pineapple and/or pecans, if desired. Serve with the cinnamon sticks. This entry was posted in MogoBlog, MogoLicious and tagged Mexican Coffee, Pumpkin, Punch, Rum.